Features: Bamboo handle, Nylon bristles (BPA free), cardboard box, polypropylene inner wrapper. Designed in Australia, made in China. Most of the Environmental toothbrush and packaging are plastic-free and compostable (inner sleeve is plastic). Nylon bristles are biodegradable. The environmentally friendly toothbrush from Jillby Eco is made from natural bamboo, a fast-growing, sustainably harvested crop native to Asia. 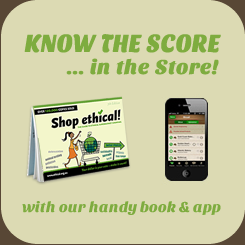 Designed in Australia by Ethical Produce Solutions, an Australian company. Made in China. Features: 100% post-consumer recycled polypropylene #5 plastic and Nylon bristles. Recycled plastic wrapper which doubles as a prepaid mailer. Made in the United States.Preserve toothbrushes are made from recycled yogurt containers and other post-consumer #5 polypropylene plastic that is returned to them through their Gimme5 program. Easy in the USA - some travel miles here. Features: From renewable, fast-growing Birchwood trees. Tea Tree Chewing Sticks deliver Melaleuca alternifolia oil between teeth and the gum line, help remove debris and plaque in places where brushes can't reach and leave breath fresh and clean. Each toothpick is infused with a powerful array of natural plant extracts, including peppermint, spearmint, cinnamon, fennel and menthol. A stick, from the root of the Peelu tree, is a natural and more effective toothbrush than your typical plastic and nylon kind. Naturally kills bacteria and fights plaque. On it's own. With no toothpaste.